Recently designed by Krista + Home Design, this 6000 sqft waterfront beach house is nestled on the Intracoastal Waterway in Tequesta, Florida. The homeowner has teenage boys, so she wanted something comfortable and family friendly with classic touches. 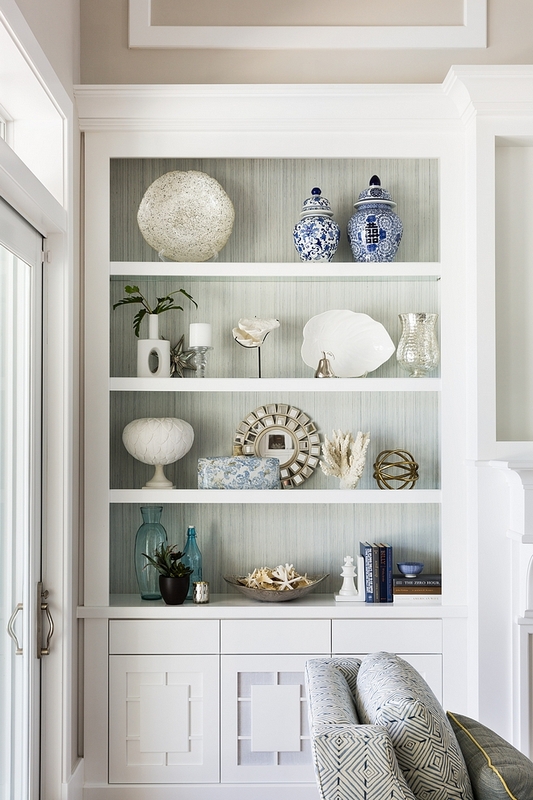 The interior designer gave this beach house a clean, coastal design that is inviting and livable for all the family members. See all sources, including paint colors, shared by the designer. The foyer features grid board and batten paneling and White Oak hardwood floors. Paint color is Snowfall White by Benjamin Moore. Metal & Glass Accent Table: Uttermost. 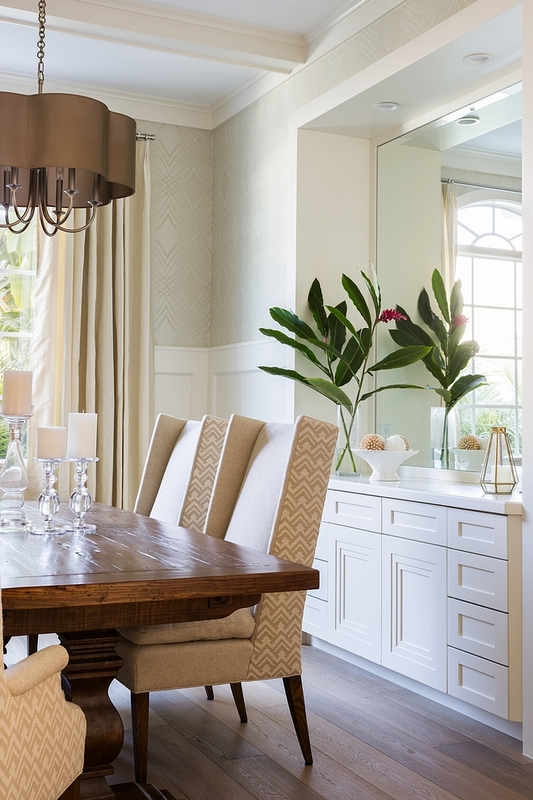 The foyer opens to a classy and neutral dining room. Dining Chairs: Hickory Chair Martin – Similar Here, Here, Here & Here. Dining Table: Custom. Similar Here, Here & Here. Drapery: Restoration Hardware – Similar Here (Drapes) & Here (Hardware). The dining room features a built-in buffet (notice the door details) and a neutral wallpaper above the wainscotting. 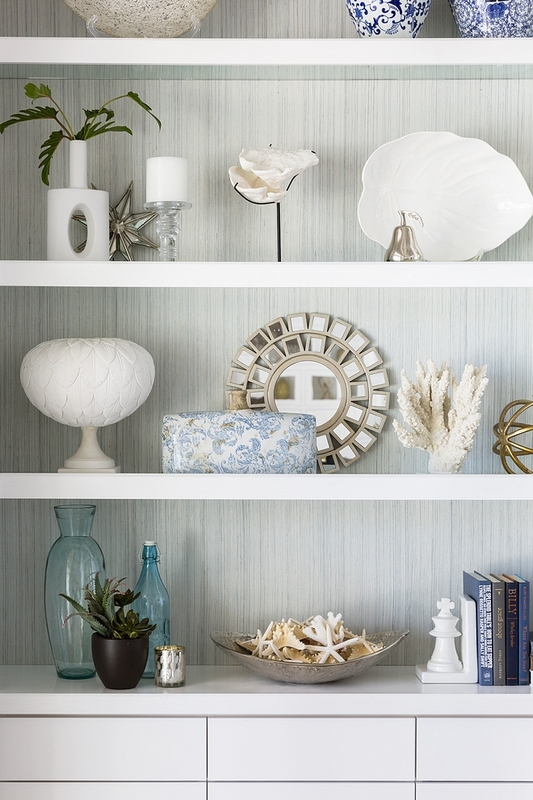 The wallpaper is Seabrook GA30800. Hardwood flooring is 7-1/2″ White Oak planks. Similar here, here, here, here, here & here. Sofa is Kravet Jazz Sofa. Fabric: Kravet Smart, Afterglow Patina. The console table is by Stanley Furniture. 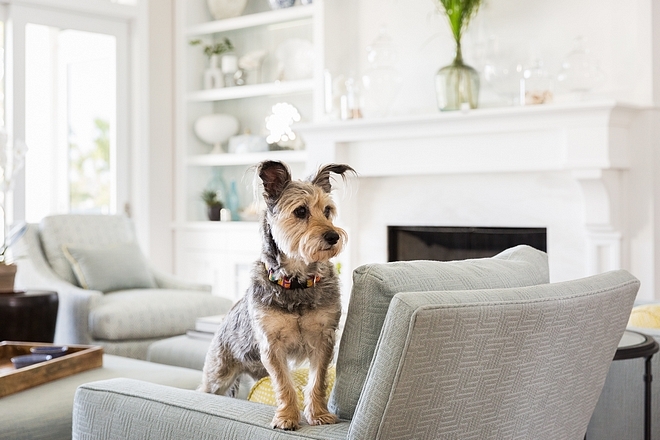 Wall paint color is Baby Fawn by Benjamin Moore – I’m in love with this neutral color. 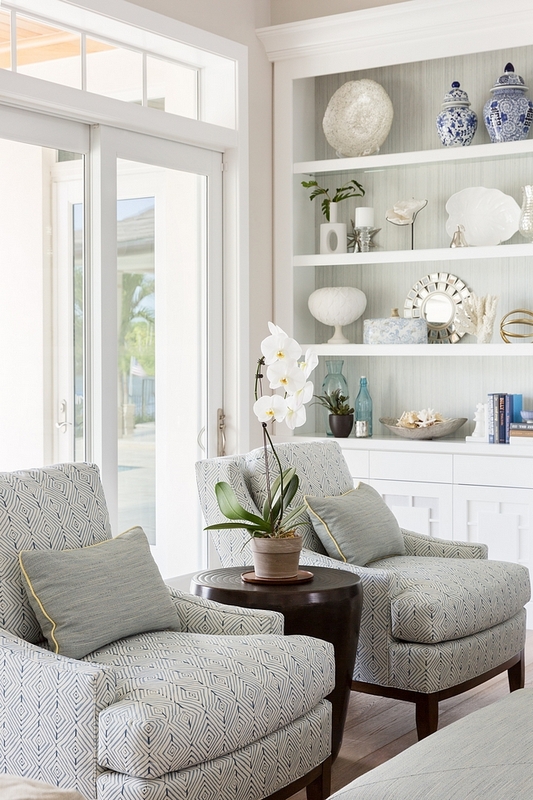 Chairs: Kravet Bellair Club Chairs. Fabric: Kravet #32826-5 Mattydale Rain. The trim/millwork paint color is Benjamin Moore Snowfall White. Bolster Pillows (on right): Duralee Lemon Ice 36140-650. Pillow on sofa can be found here. The cabinet maker for the built-in bookcases was John Fasig in Jupiter, Florida. Wallpaper is Phillip Jeffries, Soho Hemp, Blue and Grey. Kitchen countertop is Mystery White Marble. The counterstools are by Kravet. Fabric: Kravet 33378-52 with Kravet 33333-4 Welt. 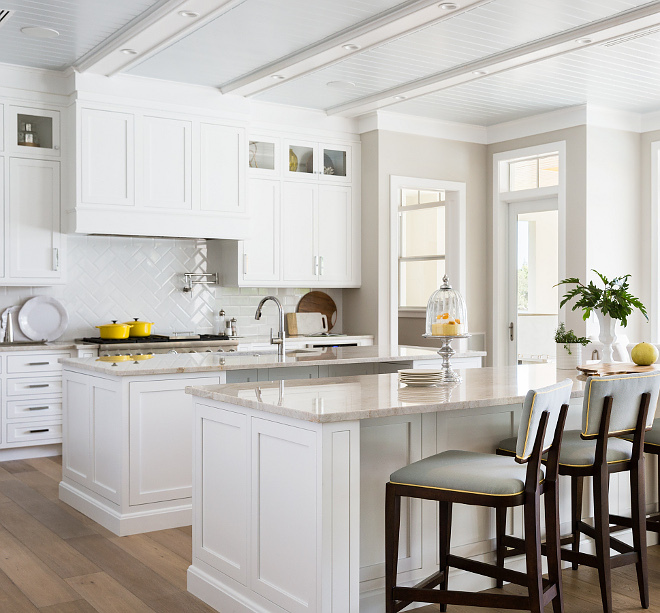 The kitchen features white subway tile in a herringbone pattern above the range. Similar Backplash Tile: Here, Here & Here. Cabinet Hardware: Drawers – Doors. 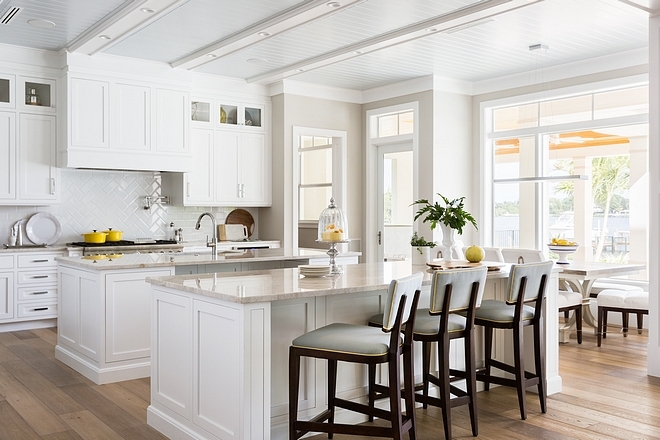 Kitchen Cabinet Paint Color: Snowflake White OC-118 by Benjamin Moore. 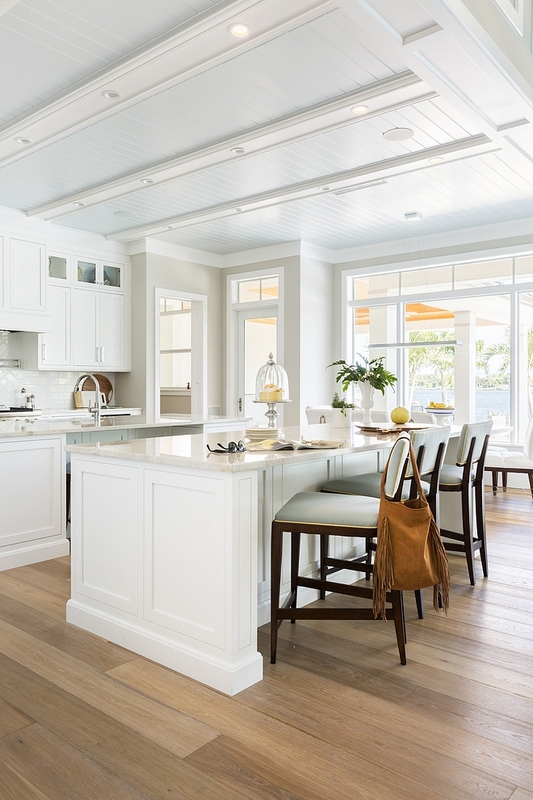 Notice that this kitchen features two islands. 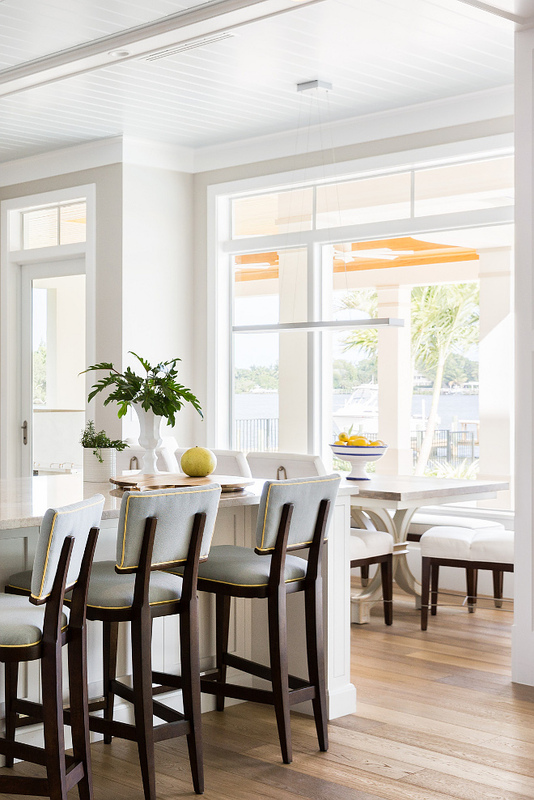 The breakfast nook is stylish and it offers an incredible waterview! Chairs: Kravet Buckley Dining Chairs. Dining Table: Stanley Furniture. Round: Here. Baby Fawn OC-12 by Benjamin Moore. Neutral bathrooms are timeless and you never get tired of it. Cabinetry finish: GC-15 Baby Fawn Benjamin Moore. Floor tile is Mystery White Marble honed cut 6×24 Herringbone Pattern – Similar (in Porcelain) Here & Here (Grey). Interior Design: Krista + Home Design (Instagram – Facebook).